Download now. Free to try, no obligation to purchase. Click here. 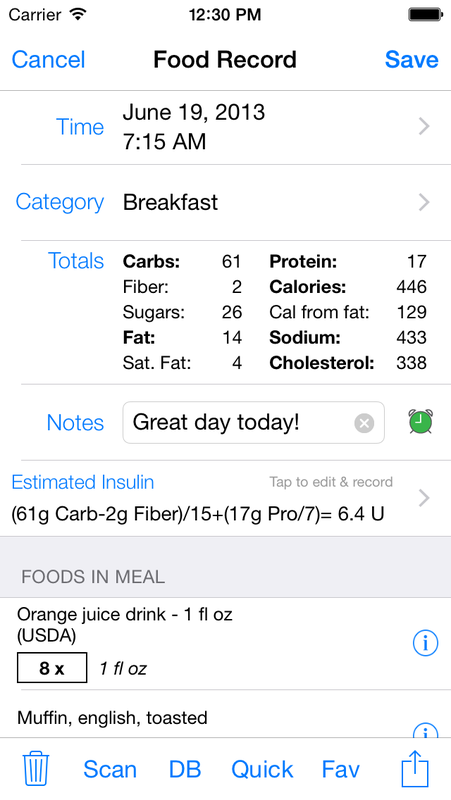 Diabetes Pilot Pro is the premier tool for managing diabetes on your iPhone or iPod Touch. Developed by professionals, backed by an established company, and designed and supported by people with diabetes who use the software themselves - it's fast, flexible, complete, and easy to use. It works by itself or in combination with our Mac, PC, and iPad apps (available separately). 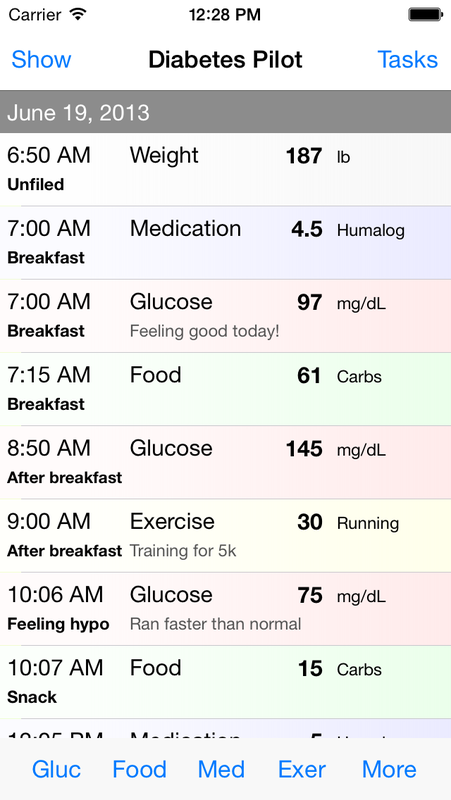 Diabetes Pilot Pro is designed for all people with diabetes - whether you use insulin, other medications, or just diet and exercise, Diabetes Pilot can help you organize and analyze your information. Record glucose (mg/dL or mmol/L), medications, meals, exercise, blood pressure, weight, and notes about test results or any other information that's of interest to you. Sync record data and foods directly with our Mac, PC, and iPad apps (sold separately) via WiFi. Your data is kept under your control, on your own devices, for reliability and privacy. Use the integrated food database to track carbohydrates, calories, fat, protein, fiber, sodium, cholesterol and other nutrients. Scan barcodes on food packages to add foods to your record. 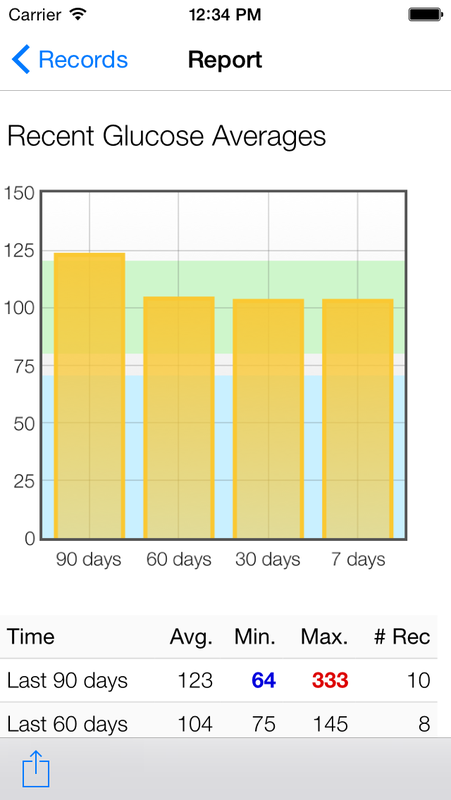 Analyze your data with over a dozen customizable reports and graphs! Save, print, and email reports directly from the app. Reminder alerts can be set on any record. Categorize records using any system that you'd like. Use these categories to focus on particular situations, times of day, or other patterns that are of interest to you. Create reports to study the trends in your glucose readings within each particular category. Enjoy the support of a solid company that's been making diabetes software for over a decade! Contact us anytime - you'll get a prompt and knowledgeable response.